Writing these wrap-up posts on my educational experience has been much harder than I anticipated. All in all, I tend to be a person that actively tries to find the best in every situation and tries to forget about anything bad or contentious. A big part of me wanted to stop after I wrote My Library School Experience: The Good. I didn’t want to relive some of the more difficult moments; I didn’t want to get bogged down in the negativity; and I wasn’t sure if I could write about some of these things without being too emotional. Ultimately, I decided that I’d already written about most of the ugly experiences in earlier posts – and that some serious reflection on these experiences could be a good thing. Hopefully, this post doesn’t make me sound whiny, bitter and/or pissy. I’m trying to be fair. However, these Ugly experiences are ones that I found to be truly unacceptable in a graduate program that cost me a significant amount of money – regardless of the mode of instruction. I consider 3 out of the 12 classes that I took to be not in any way worth the money that I spent on them. I think it is important to note that 2 of these classes were required or core courses (reference and cataloging). In my second semester, I took the first of the three classes. I was horrified by the class. It seemed to me that the professor was barely present. She did not participate in any discussions (which seems to be somewhat normal in distance education – and I don’t get it). She was slow in responding to emails and even very slower in returning work. I know that professors might not think this way, but it was vitally important to me that my first assignment with a new professor be graded (with helpful feedback) prior to the due date of the second assignment. In a distance class, there is no opportunity to “read” the teacher. There is no way to glean what the professor might be looking for by listening to him/her or by interacting in face-to-face discussions. When there are only 4 graded assignments which make up one’sfinal grade, I think that students must receive some type of feedback before successive assignments are due. When assignments were returned, there was very little feedback. With no feedback and no teacher participation in discussions, it didn’t seem as if there was any personality in the class. Where was the expertise of the professor? I never saw it. I remember talking to my Mom about this class at one point, and I know that I told her that this was the worst class I had ever had the misfortune to take. I wasn’t kidding. Little did I know that it would get worse. During the next two semesters, I had two more classes with another professor that seemed as if they were self-taught tutorials. During the summer session class, which began on the Tuesday after Memorial Day Weekend, the professor sent us all an email on the first day of class asking us to let him know that we were able to get into the course site. Each week, lecture notes and assorted information for that unit were made available in the course site. I, personally, did not hear from the again professor until he returned the first graded assignment on July 29th (which as due roughly a month before). Essentially, there were two months without any type of direct contact from the professor. Several students mentioned that they had sent the professor emails, and did not hear back from him until weeks later. I was blown away by this. I never specifically received a grade on the other three assignments or the final exam – only a final course grade. I didn’t know what to think. I could only hope that no school would think this is acceptable behavior on the part of a faculty member. Certainly when I wrote a letter to the ILS department chair, she seemed to take my complaints seriously. Of course, I’m not sure that there is anything a chairperson can do other than simply talk to a tenured faculty member. Regardless, I had the same professor for a class that fall. While his grading time frame was a slightly better, he was still a non-existent entity in the class. All three of these classes were a waste of my time and roughly $4000.00 of my money. These are definitely examples of the worst that distance education has to offer. I hate to taint the entire ILS administration here, but when the dean of the school blatantly ignores a letter that a student sends (twice), it sends a rather negative message. As part of an effort to put together some concerns and problems that were specific to distance students, I worked with a fairly decent size group of students and recent graduates (as many as 60 at one point). As a result, I wrote a letter and emailed it to the professor who was the chair of the ILS department. She was quite receptive to the letter, and it seemed to be a good starting point for a discussion. Things, however, went quickly downhill and some serious us vs. them vibes sprung up with angry students and some defensive professors. I felt awful about the entire situation. However, I believed (and still do) that there were some serious problems that really needed to be aired. With that in mind, I emailed the dean asking if I could send him a letter with some of my concerns and those from other students. He responded quite quickly in a positive manner. I emailed him the letter that I had written with absolutely no reply, not even an acknowledgement. With the understanding that people could have busy schedules, vacations, email problems and other freak things happen, I emailed him at least a month later with the same result. I discovered from another source that he had received my email. To me, this was the low point of my entire time at SCSU. Whether this was intentional or not, this experience was the one that truly made me believe that concerns of distance students were not even on the radar screen of the administration. This was a huge blow that made me feel as if I was not even an insignificant part of the SCSU community. This is where I decided that I needed to remove myself from the effort to get the voices of distant students heard. I will admit that this failure to offer any type of response to my letter will always color my view of my time at SCSU in a negative way. Sometimes, I still can’t believe it. One of the things that prompted me to write this post now is my own reaction to receiving my diploma in the mail last week. I was utterly surprised by the overwhelming feeling of accomplishment that I felt when I saw the actual piece of paper for the first time. Regardless of the worth of the program, the value of the MLS, the positive experiences or the negative ones, I am deeply proud of myself for going to graduate school and completing the MLS program at SCSU. It wasn’t easy. I learned a great deal. There were many challenges, and I think that I met them in a appropriate manner. Personally, I got something important and fulfilling out of my graduate school experience – and this is worth a great deal to me. Also, I was going through this blog last week, reading some of the posts about my negative experiences at SCSU. More about some of these will come when I get to the Ugly post. However, I was reminded about something my mom said to me once when I was talking to her about a particularly awful class that I had when I was in college. My mom told me that she agreed with me about the quality of the class (it was a dogmatic ethics class based in theology where there was no room for discussion or disagreement – something with which I was quite uncomfortable), but she thought I should try to look at the experience in a different light. From her perspective, she saw the hours and hours that I spent talking about the class with her and my dad – discussing my thoughts about the course material; arguing why the professor’s logic was faulty; developing my own sense of what it meant to be ethical. Possibly without meaning to, that professor made me think more than most others. My mom was right. There is something critical to be learned from bad experiences. I can’t change the bad experiences, the bad classes, the bad professors, but I can take something positive from them and try to learn from them. As I thought back to this discussion with my mom, I realized that I did learn something from each bad experience at SCSU. These experiences did not ruin my education. They changed the direction that my education took. Would I pay for some of the classes that I took again? Absolutely NOT! Despite this fact, I did use the bad experiences to make the rest of my journey a more fulfilling one. I gave more of myself to my remaining classes because it was important that I not let myself get mired in negativity. The unsung hero of my graduate school experience is my advisor, Dr. James Kusack (I did ask if I could mention him by name). I feel truly lucky to have worked with him and even luckier to have studied with him. He is a wonderful teacher – and way by far the best teacher from my time at SCSU in the online environment. He was engaged in each class that I took with him; he participated actively in online discussion; he was incredibly responsive to student inquiries; he graded assignments with tremendous speed, yet in such a way that revealed he had indeed taken time to read the submissions; he gave tremendous feedback at every opportunity; and he seemed to truly enjoy teaching. I agonized over many of his assignments – mostly since many of his management exercises seemed to overlap with the reality of daily life in an academic library. However, I learned a great deal from them. I’m not sure that I was able to appropriately than Dr. Kusack. I came close to leaving the program last summer – mostly because there were several months where I really believed that many of the ILS administrators at SCSU had little regard for the distance ILS program and its students. Dr. Kusack reminded me that there were people at SCSU that did care, and I am extremely grateful for this. I do wish that I could have taken a face-to-face class with Dr. Kusack. It is very strange to get to know people without ever having met them in the physical world. Regardless, Dr. Kusack was one of the best experiences from my time at SCSU. The thing that surprised and shocked me the most was ILS680-Evaluation & Research. I can tell you that I was petrified about taking this class. Students talked about how difficult this class was – and I got too caught up in that. Additionally, I wasn’t entirely sure how valuable a research class would actually be. After all, I was a history major in college – and had written many, many research papers in my day. This meant that I was expecting the class to be lots and lots of work with little reward. Boy, was I wrong. ILS680 ended up being my favorite class. It was extremely difficult. There was so much work to do in a short amount of time. However, the professor had a suggested timeline. I admit that I got sidetracked a couple of times, but I was able to get myself back on track. Additionally, writing the paper for this class was extremely fulfilling. I was so utterly amazed – and happy – with the end result. As I think I have mentioned before, this was the perfect ending to my MLS experience. It really served as a capstone experience for which I was able to pull together much of what I had learned. So really, I did have some great experiences! Look what I found in my front door this morning! I wasn’t expecting this for at least two more months, so I was pleasantly surprised when I opened the envelope. It is a bit funny that this envelope had been in my front door for several days. I remember seeing it several days ago when I got home from work, but kept forgetting to actually open the front door and get it. Fortunately, it survived two days of heavy, heavy downpours. Thank goodness that the mail person had put it in a bag!! 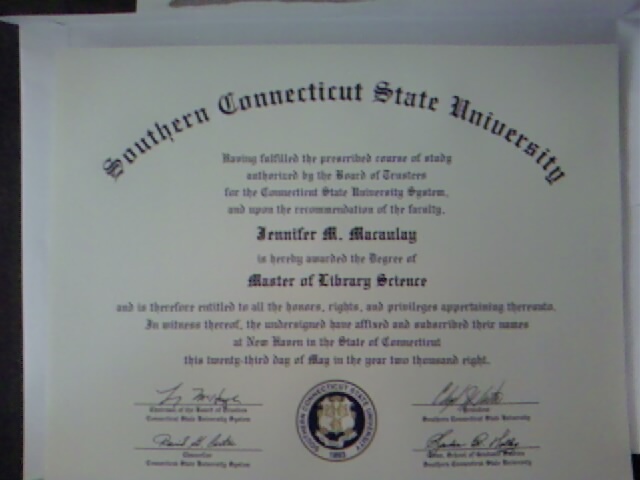 Anyway, I was very excited to actually have the piece of paper in hand. It definitely feels much more official now. Cool! You are currently browsing the archives for the library school category.